File photo of Bodoland University. 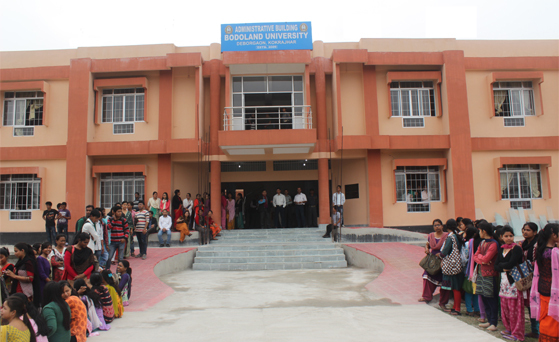 The Bodoland University (BU) celebrated its 22nd Foundation Day on Thursday with a day-long programme at the University premises at Debargaon in Kokrajhar. The Bodoland People’s Front (BPF) MLA Pramila Rani Brahma who graced the function as the chief guest said that the said varsity was still at a “fledgling stage and a lot of infrastructural development was required for which huge amount of funds would be needed”. The BTC Deputy Chief, Kampa Borgoyary, refuted allegations made by a certain section of people that the “Assamese language was relegated to the back burner in Bodoland University. The question of neglecting the Assamese language simply does not arise as the Vice-Chancellor of the institution is himself an Assamese person and most of the departmental heads and professors are Assamese-speaking people”. “I also gave my speech in Assamese as it is the thread through which the different tribes and sub-tribes comprising the greater Assamese society gets bind. In any event held in the University, the Assamese language is spoken and not Bodo,” affirmed Borgoyary. Borgoyary’s point is that when the “mainstream Assamese people can assimilate the Bodo culture, therefore, the Bodo people too have no problem in accepting Assamese culture and traditions”. He slammed a certain section of the media for spreading such “false rumours so that they can sell few more copies of their newspapers”. Borgoyary asked people not to get “agitated” by such “false news that Bodoland University is not trying to teach Assamese as a subject and language per se”. Saplings were planted on the occasion and apart from Pramila Rani Brahma and Kampa Borgoyary, the Vice-Chancellor of Bodoland University, Professor Hemanta Kumar Baruah, Registrar Dr Shekar Brahma and several other dignitaries attended the programme.